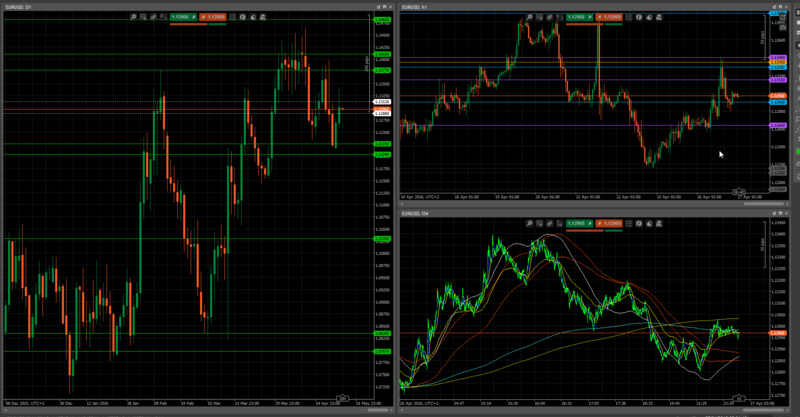 New levels for EUR/USD. Made today. Should be very accurate. (More accurate then before tbh) Last time I used only one TF. I admit I have still mess in TF’s. :'( Need to fix it somehow ASAP. // I watch EUR/USD for now. Hi Saver, nice looking charts. :) Now to your question. Yes I thougt about that and yes, of course they are patterns with high recurrence. I trade these mostly. And time profitable is about 90%. These 90% win rate works ONLY if you really respect every pattern and use it way as you should. Thank you Simplex. :) I’ll do for next time. Nice catch. That should help. At least i hope. Second one was probably just RSI. Will try. Ty. Of course you can ask. :) That’s why I’m here for. Using “bands” that make high or low on level X where price will 1. reverse or 2. break with pullback and trend continuation. Very simple. I’m playing or watching my levels today, and this is what just happened. High on my exact level 1.1480. Very interesting. There is chance we will go back. Sorry I can’t code anything. My platform use C# but I can’t code anything expect High – low * X..